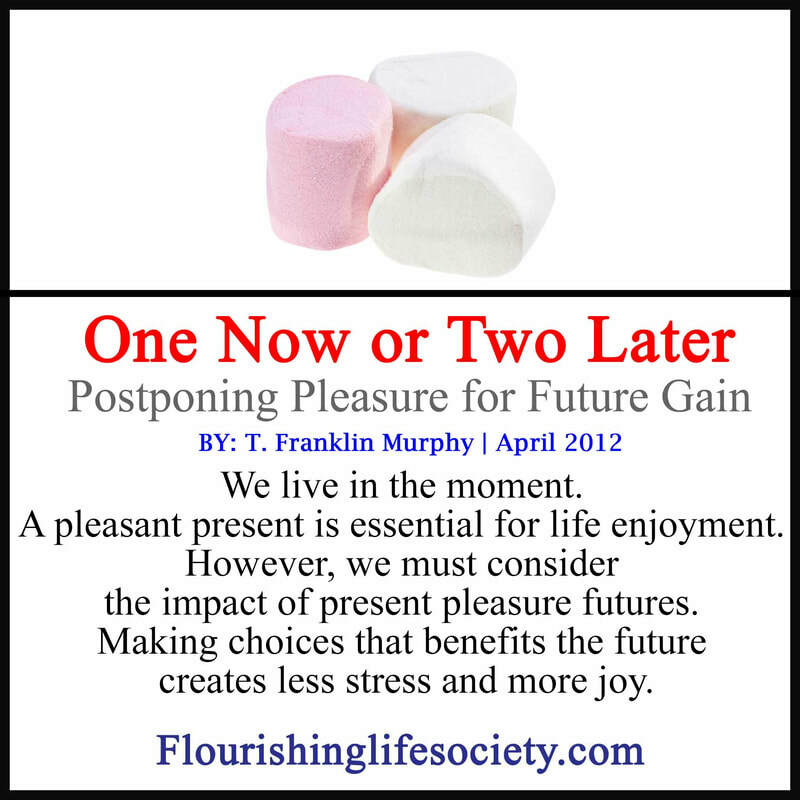 The present offers some fabulous gifts; but sometimes (often) we should pass and work towards a better future. Walter Mischel, a behavioral psychologist at Stanford University, examined impulsivity among five-year-old children. Mischel placed a small marshmallow in front of each child, instructing them if they wait to eat the marshmallow, he would reward them with two marshmallows when he returned. Some waited and subsequently enjoyed a second marshmallow; but for others, the temptation was too much--they forfeited the future reward for immediate pleasure. A few decades later, Mischel followed-up on these young marshmallow-eaters. He surprisingly discovered the five-year olds that waited—on average—performed better in college, relationships and careers. Real life decisions are more complex than choosing between a single treat now or double the treat later. The future lacks certainty. Wisdom teaches that some suspension of immediate gratification is required for bountiful futures. The sacrifice of immediate pleasure for future gain requires Self-discipline. We must suppress impulses before acting to examine consequences. Stopping automatic behavior with thought demands energy. Without intentional intervention, we risk losing a dazzling future for the sparse benefits in the present. Actions are maladaptive when they fail to secure our desires. Either we have faulty expectations, believing an action rewards differently than reality dictates, or we lose sight of the future and appease unhealthy appetites in the present, justifying we will act better next time. Complexity complicates the simplicity of these decisions. The moment of choice is not forced at a particular point in time. A right choice can be procrastinated or diluted with surrounding wrong choices. We magnificently mold our views of life to fit a comforting explanation. Our wrong choices lose poignancy but continue to haunt. We need more clarity of vision—a strong nexus between the choice and the consequence. If we can’t see the connection between our lack of punctuality, skill and attentiveness and being passed over for promotion, we won’t make the sacrifices needed to change. Unhealthy behaviors still reward, giving a different set of benefits (the single marshmallow is still sweet). The immediate rewards, however, are short sighted, giving pleasure while destroying futures. We usually don’t adopt maladaptive behaviors that lack some reward. We often fail to weigh the costs and future gains. And once habit takes hold, we just act without thought at all, like with drug addictions, we continue maladaptive behaviors long after their diabolical pleasures have ceased. When under the spell of addiction, new rules invade, utility of choice diminishes, and we just act, slowly moving towards our own demise. These rules of addiction apply to more then an opiate craze, we may habitually explode in anger, or shutdown from connection, or avoid opportunity. Addictions befall us in countless fashions, many appearing harmless and comforting. "Actions are maladaptive when they fail to secure our desires." While maladaptive behaviors provide pleasures and escapes, they also exact a heavy toll, increasing anxiety by multiplying difficulties. Wise choices in the present demand momentary discomfort, utilizing energies now while constructing fruitful futures—less stress, more rewards. When we act without intention, jumping at the strongest impulse, we often lose. Slow down and ask, “what are my options? What are the likely consequences? What can I do in the present to achieve the future I desire?” Our futures are constructed with bricks placed in the present. We need to know which bricks to use, how to use them, and where to gather them. If we want to retire, increase intimacy, or live in a nice house, we must act in the present, sacrificing smaller rewards for the much larger achievements. Would you like to eat that marshmallow now?